Virgin coconut oil has amazing properties for skin, hair and body. It is inexpensive and easy to use. Learn how. How does virgin organic coconut oil benefit your skin? There are many different properties that make this oil a wise choice for your beauty regimen. Use it alone or in combination with other natural ingredients for softer and healthier skin and hair. Virgin coconut oil has healthy fats that help your skin retain moisture and deeply condition your hair. It is available at you local market. Look for it in the baking aisle or cooking oil aisle. Coconut oil was given a bad rap in the past by scientists and doctors because the studies about this oil were mainly investigating hydrogenated coconut oil. Now that virgin coconut oil has been looked at carefully, we now know that there are fantastic benefits for this oil. It is loaded with Vitamin E. Vitamin E can help prevent fine lines and wrinkles. Use organic coconut oil straight from the jar to moisturize skin, remove make up or condition hair. Coconut oil contains Lauric acid. Lauric acid has been shown to deal with viruses and bacteria that cause disease and is used extensively in Ayurvedic medicine for this reason. 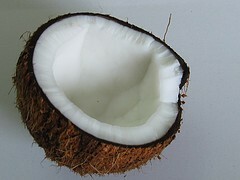 Virgin coconut contains medium-chain triglycerides which may not carry the same risks as saturated fats. The properties of coconut oil may even help you to lose weight by boosting the metabolism. Coconut oil has a nice nutty flavor that is retained after cooking in baked goods and fried foods. Rub it on your skin or cook with it. Coconut oil can be use right from the jar and applied directly to skin. It is a great massage oil. If the coconut oil is solid, just scoop out a little and warm in hands. It will melt quickly into soothing oil that feels great when rubbed into the skin. There are very little side affects with coconut oil as compared to other skin products that are filled with harsh chemicals and abrasives. Massage in coconut oil as a conditioner and use as a hair gel. It is used daily in India for a hair treatment. Treat scalp with coconut oil to get rid of dandruff. The antibacterial and anti microbial properties will eliminate dandruff. It helps skin from sagging and wrinkles. Apply gently around the eye area at nightime. Make you own skin care mat home for pennies! You can opt to use coconut oil straight from the jar or combine it with some other fantastic ingredients like lemon juice, oatmeal, avocado, shea butter, cocoa butter, bees wax or honey for even more benefits. Melt coconut oil with a little beeswax or shea butter, pour into jars or lip balm tubes for a refreshing natural lip balm that relieves chapped lips. Use this blend from small pots to apply to eyes for a wrinkle cream or hands for a simple moisturizer. You can add a drop of essential oils to this mix for a great scent. Try rose, lilac, ylang ylang, rosemary, lemon thyme, vanilla or peppermint. Combine coconut oil with castor oil for a great facial cleanser that can be used daily. Use the coconut oil with castor oil in a 3:2 combination. 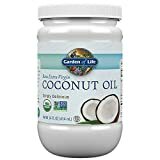 You may have to heat the coconut oil until it liquefies to combine it with the castor oil.Store in a small, sterilized air tight jar for daily use. A simple 5 step facial mask with coconut oil will give your skin a healthy glow. Whatever regimen you choose for your skin and hair, include coconut oil for deep beneficial beauty treatments with fantastic results. Lose weight, treat heath problems, detoxify and change your life. This boxed set offers you information on the types and history of coconut oil as well as internal and external uses for coconut oil. Many foods have antioxidant properties or compounds that naturally improve well being. Proper diet along with exercise keeps a body strong and healthy. Let's examine natural health, healing and organic remedies to keep you hearty and healthy. Take care of your skin using natural ingredients like herbs, roots, fruits, vitamins, oils and flowers. Natural ingredients are difficult to find in mainstream skin care since they are often tainted with harsh chemicals and abrasives. Use Mister Kemp's Hemp to learn everything there is to know about hemp and natural hemp skin care, clothing and remedies. I'll give this a try. Nice article. Hmmmm wonder if it will help my poor dog with his skin infection..